The volleyball serve is one of the six basic volleyball techniques. A serve is used to put the ball into play to start the volley. The serve is the only skill controlled solely by one player. Advanced players take advantage of this fact by developing their serving skills. How tough players serve has a huge impact on whether or not the other team will return the ball by attacking it or send over an easier ball to play such as a free ball. Therefore, a players serve will dramatically affect the outcome of the volley and then of course the outcome of the game. An underhand serve is a volleyball serve in which the ball is given a slight under-hand toss from about waist high and then struck with a closed fist by the opposite hand. The underhand serve is usually the first type of serve taught to a beginning player in youth volleyball. The overhand serve is done by tossing the ball up into the air then striking it with the opposite hand above the shoulder. Float Serve The float serve is done by contacting the ball is such a way that the ball doesnt spin which makes it more likely to float. A floater is much tougher to pass because the flight of the ball is much less predictable. The volleyball floating action is similar to a knuckle ball pitch in baseball. 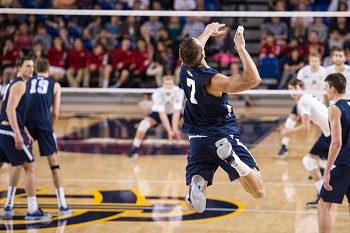 The jump serve is a serve in which the server tosses the ball, takes an approach and jumps to spike the ball. Because of the importance of timing the toss and jump, the jump serve can be very difficult to learn. A round house serve is also known as a windmill, hook, or smash serve. The round house is rarely used because it's so difficult to serve in consistently. For this serve, the server faces the side line being perpendicular to the end line. The ball is tossed straight up in front of the body with both hands so that it will be directly over the serving shoulder. The serving arm is brought from against the side straight out and over the head with the elbow kept straight at all times. Contact is made with the ball at a point directly over the shoulder and with the heel of the open hand. The ball is hit so it will slightly rise up and go over the net with a lot of topspin. This serve can be difficult to pass because the ball drops over the net very quickly and comes very fast. An ace serve is a serve that hits the floor or causes the passer to misplay the ball such that the ball isnt returnable. Friendly fire is being hit in the head by a teammate's serve. A lollipop serve is a very soft serve, often served high over the net with just putting the ball in play. A server that serves the ball really hard is known as bringing the heat or bringing the thunder. There are 6 serving zones on each side of the volleyball court. and middle back position is zone #6. Coaches sometimes signal to the server which zone to try to serve to disrupt the opponent's offensive system. the volleyball server commits a foot fault or illegal contact of serve. The service winner is a point thats scored by the team that is serving. The point can be scored immediately as in the case of an ace, or later on as in a kill or opponents attack error after a long rally.